When I visit a new town, I try and look for areas and structures that I may not see anywhere else. You know, that uniqueness that makes a town extra special and makes you want to come back again. I thought it would be fun to tell you know about 6 ways to enjoy historic architecture in Hendricks County. 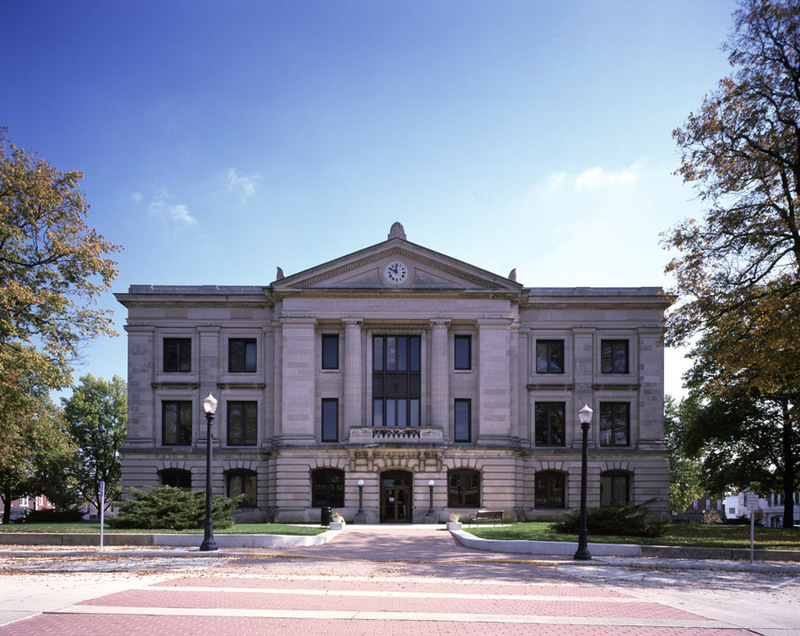 Take the kids for a drive, show them around and let them snap a few photos to show off to their teachers and class about what great architectural spots you can find right here in Hendricks County. Danville Main Historic District According to the National Register of Historic Places, Danville’s Main Street Historic District has 37 historic buildings (within 90 acres) with architectural styles from Greek Revival to Queen Anne. You’ll find this historic district at East, Main, Cross and Marion streets. Some visitor attractions within those historic buildings that you won&apos;t want to miss are the rotunda inside the Hendricks County Courthouse, Hendricks County Historical Museum featuring the old sheriff&apos;s residence and county jail and the Royal Theater, which I will discuss in more detail later. You can read more about Danville’s historic town square here. Spend an afternoon walking around the square, like I have a few times, and you’ll be immediately charmed by the loveliness and history of downtown Danville. Plainfield Historic District According to the National Register of Historic Places, Plainfield’s Historic District has about 174 buildings within 582 acres with architectural styles from Late Victorian to Mid-19th Century Revival. You’ll find this historic district at Lincoln, SE, Ash and Mill streets and make sure to drive through Downtown on U.S. 40. The town and local businesses partnered a few years back to bring the downtown buildings back to a more original look through a major facade program. One particular building a few blocks off U.S. 40 that you will want to check out is the town&apos;s restored interurban depot at 401 S. Vine St. You can read about Plainfield’s history here. Plainfield will even celebrate their 175th anniversary in 2014. I’ve spent some time in downtown Plainfield and have marveled at the history of the buildings. Don’t forget your camera and history of the town. Bridges If you love looking at, walking on or driving underneath historic bridges, Hendricks County has you covered. The most notable would be the haunted bridges that you can see in a couple of different spots near U.S. 36 in both Avon and Danville. To get closer looks at both drive south on County Road 650 East on the western edge of Avon or follow Twin Bridges Road south from U.S. 36 on the eastern edge of Danville. Two other bridges that you will want to check out were actually moved from other locations within the state to their current locations. The first is in Friendship Gardens Park in Plainfield and the other is in McCloud Nature Park near North Salem. Both iron truss bridges now carry pedestrian traffic along trails in the parks. Carnegie Libraries: Brownsburg and Danville The historic Carnegie libraries -- there are others in Indiana and around the country -- were built with money generously donated by industrialist and philanthropist, Andrew Carnegie. 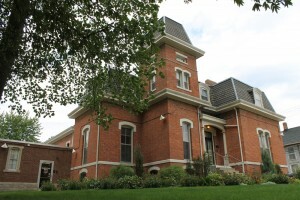 Read here for more history on the Carnegie library in Brownsburg, 61 N. Green St., and Danville’s Carnegie library, which still serves as part of the Danville Public Library at 101 S. Indiana St. Pittsboro One Room School Remember Anne of Green Gables and Little House on the Prairie? Yes, I was a big fan of both shows which had one thing in common: One room school houses. As kids, my friends and I pretended like we were old-fashioned school kids in a one-room class, by writing on individual chalkboards. Here’s your chance to visit a preserved piece of Hendricks County history, the Pittsboro One Room School. 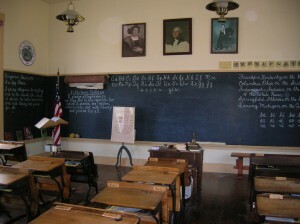 Adult and school age groups can arrange to “step back in time” to 1892 and experience a school day (A few hours for adults and about four hours for children). Individual visitors can see the architecture of the building on the outside by visiting the Pittsboro One Room School, 206 N. Meridian St., Pittsboro, but the school no longer offers public hours where they are open to individuals to see the inside. Groups, however, can contact Doris Martin at (317) 892-4107 to schedule a tour and for more information and history on the One Room School. Royal Theater As a movie fan, I have a great appreciation and fondness for movie theaters, especially ones like the Royal Theater in historic Danville, which has been in operation since 1914. Have fun and take a few photos in front of the neon blue Royal Theater sign. I don’t know about you, but I love retro signs. 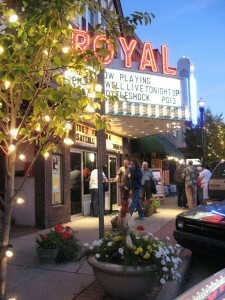 The Royal Theater has a popular following and continues to show current release family movies as well as a regular schedule of live music and other performances at 59 S. Washington St., Danville, (317) 745-1499. Help us with our list. What are your recommendations for unique architecture in Hendricks County?. Leave us a message in the comments.